Made with decadent Valhrona chocolate and sprayed with a rouge cocoa butter, Hotel Café Royal’s Easter egg is as sumptuous as they come. 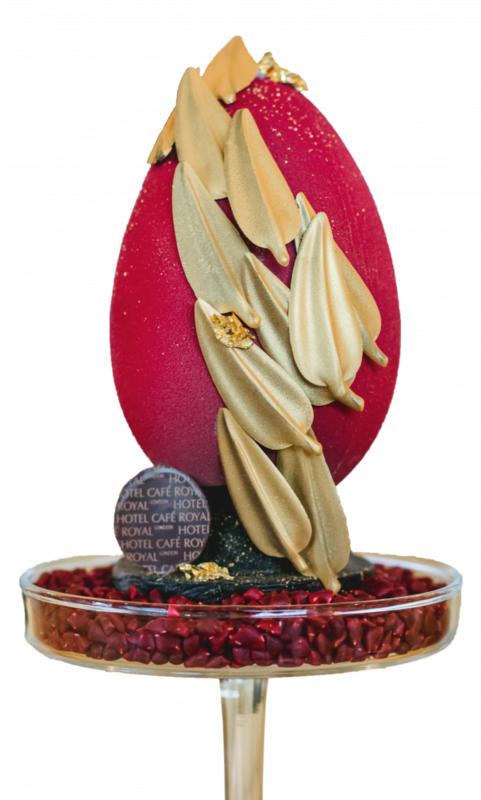 The egg, designed by the hotel’s celebrated pastry chef, Sarah Barber, encases luxurious white chocolate and raspberry truffles and is decorated with gold chocolate feathers. Taking inspiration from the hotel lobby's art deco flooring for the foil wrapper, Claridge's Easter egg has been designed by the hotel's pastry chef Yago Doamo. Each egg takes a lengthy three days to complete, is made made from dark, milk and white chocolate and is filled with chocolate praline quails eggs. 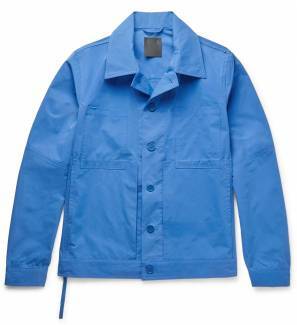 Thanks to Booja-Booja, Easter is no longer a tough time for those following a 'free-from' diet. 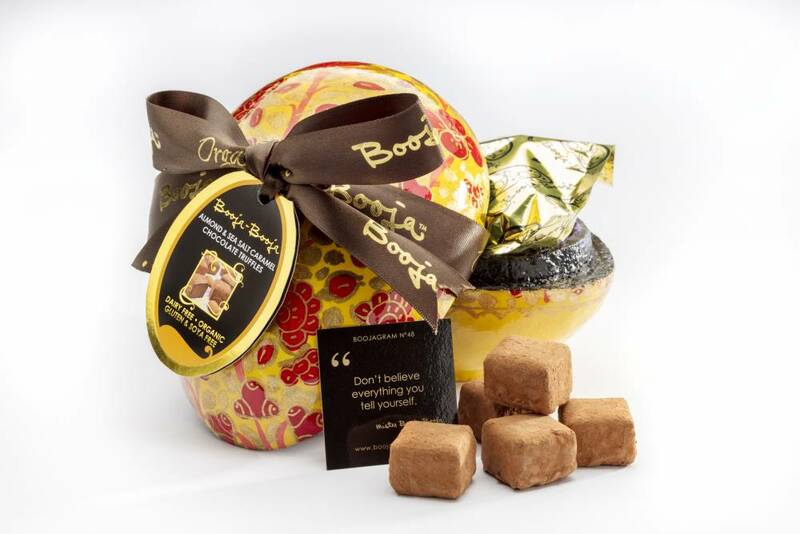 With a twist on the traditional egg-shaped chocolate, Booja-Booja has created almond and sea salt caramel truffles that are free from dairy, gluten and soya. In keeping with the Easter-theme, the truffles are presented in an ornate egg-shaped lacquered gift box, made by skilled artisans from Kashmir. 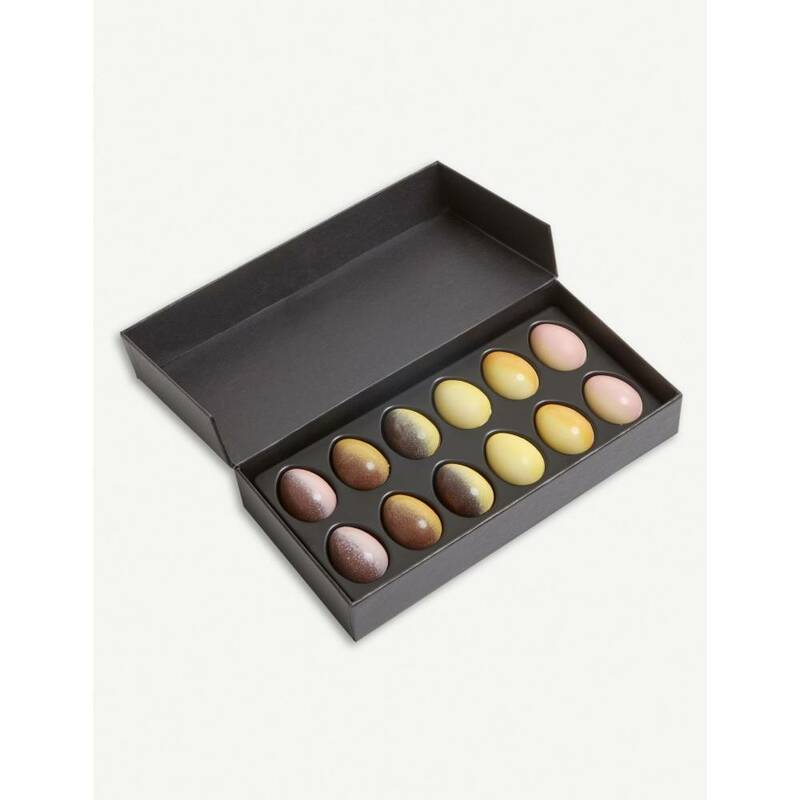 Pierre Marcolini has produced a decadent assortment of twelve miniature chocolate eggs. Including such flavours as pistachio, hazelnut, almond, praline and milk, the eggs that are made from dark and white chocolate make a delectable Easter treat for friends (or even yourself!). More of a sculpture than an Easter egg, Bulgrari has made an edible homage to the Bulgari brand in celebration of Easter. 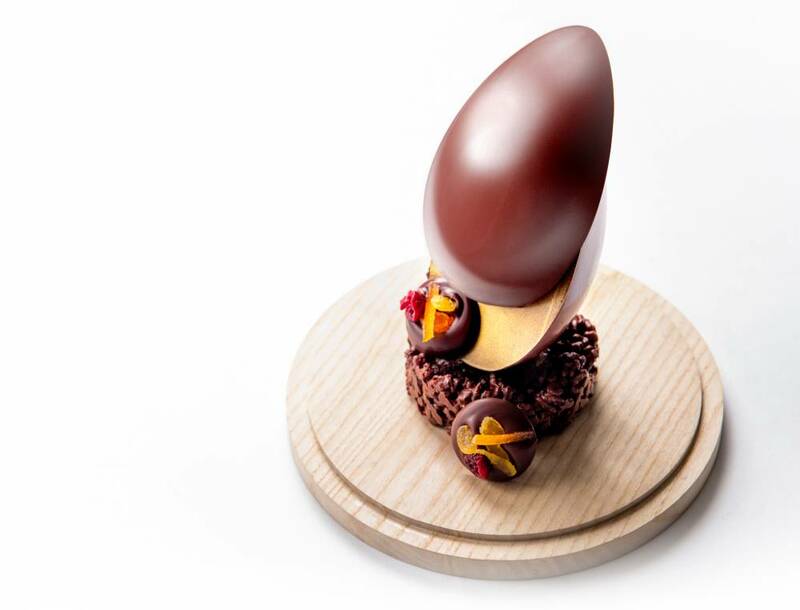 Crafted by the hotel’s pastry chef, the egg is made from a mix of cereals for the base, as well as 70% dark chocolate and a medley of dried fruit. The talented chocolatiers at traditional Yorkshire-based confectioners, Bettys, have produced a show-stopping 55cm tall Easter egg. 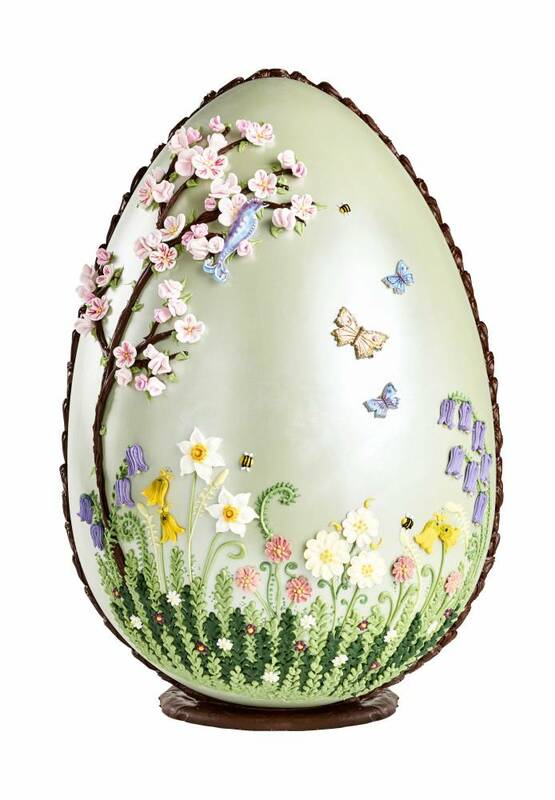 The Imperial in Bloom egg comes in a shimmery an eau de nil with an intricate floral design including hand-piped blossoms, bluebells and primroses. The Connaught's head pastry chef Nicolas Rouzaud has been hard at work creating an Easter centrepiece for hotel's lobby. 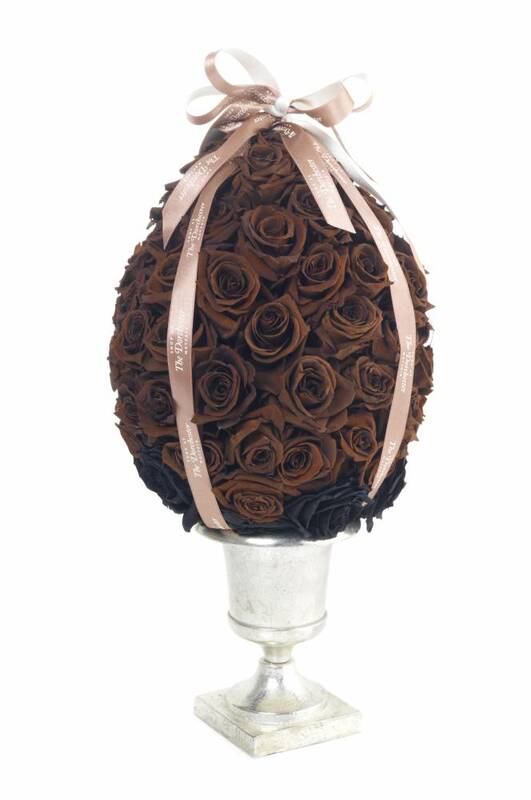 The meter tall chocolate egg is made of silky Valrhona chocolate and is adorned in floral decorations in a nod to the spring season. Taking centre stage is a chocolate interpretation of The Connaught's greyhound. While the lobby's centrepiece is not for sale, The Connaught will be delivering miniature versions of the egg to guests staying at The Connaught over the Easter weekend. 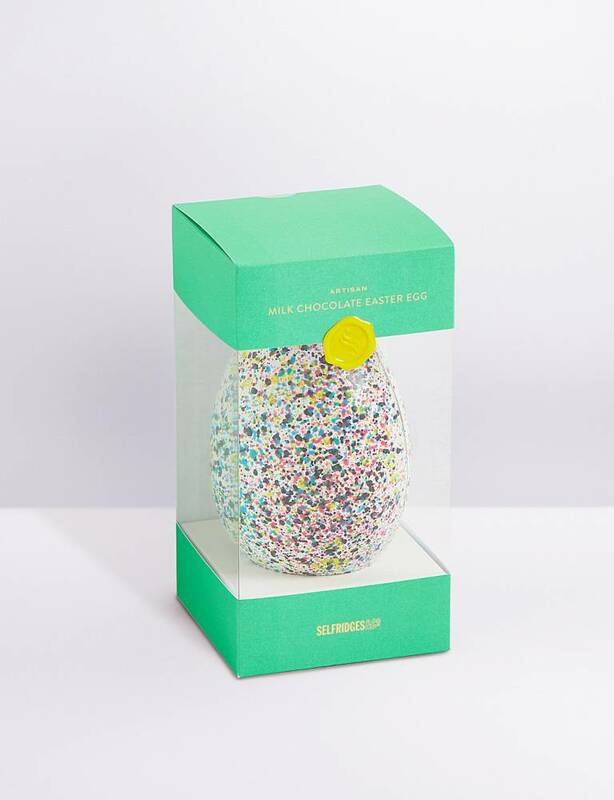 Somerset-based confectioners, The Chocolate Society, has created a series of artful limited edition eggs exclusively for Selfridges. 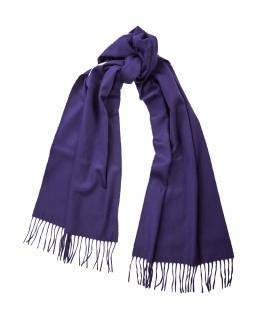 Made with glossy Valhrona chocolate, each of the 250 eggs available has been carefully hand painted by skilled chocolatiers. Easter doesn’t have to be all about chocolate, and although we’d prefer it if it was, we would consider passing up the chocolaty treats in favour of one of The Dorchester’s floral eggs. The extravagant Easter decoration has been designed by The Dorchester’s florist and is comprised of tightly bunched roses. Each eggs is bespoke and can be made to customers’ size and colour specifications. 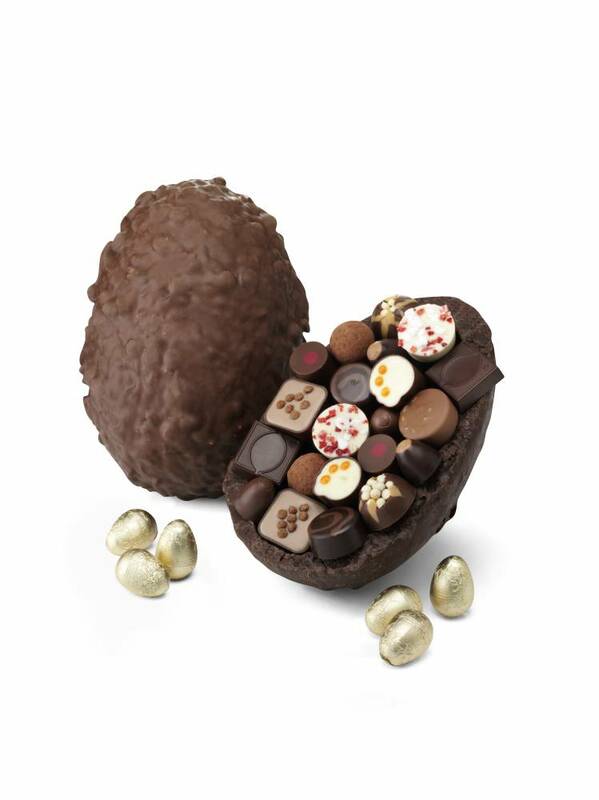 Hotel Chocolat have used over a kilogram of chocolate to create a whooping ostrich egg-sized treat. 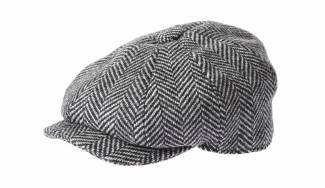 Puffed rice and cookie pieces are embedded in the extra-thick shell that comes in milk or dark chocolate. And if the enormous sphere of chocolate isn't enough, it also comes with a tray of 27 pralines, truffles and caramels.